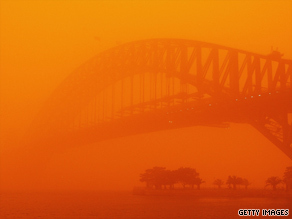 iReporter: "It was totally bizarre to wake up and see such a red bizarre sky"
(CNN) -- A massive dust storm swept through parts of Australia on Wednesday, bathing the city of Sydney in a reddish haze. The Sydney Harbour Bridge is seen on Wednesday in Sydney, Australia. Susan Paget marveled at the eerie red view from the balcony of her apartment in Manly, a suburb of Sydney, and said she took the day off work to avoid the dust storm mess. "It just feels dirty and rusty," Paget told CNN. "It was totally bizarre to wake up around 5:30 a.m. and see such a red bizarre sky." Health officials in Sydney warned residents to stay in indoors if possible, especially if they had asthma or heart and lung conditions. The Ambulance Service of New South Wales said the dust storm had kept it busy with emergency calls. iReporter Mark Clarke told CNN he woke up earlier than usual with a stuffy nose and cough at his home in Stanmore, a suburb of Sydney. iReporter: "It was like Mars"
He pulled the curtains back and saw a "strange red orangish glow coming from outside." The country's bureau of meterology attributed the red haze to strong north-westerly winds which blew the dust overnight to Sydney and regions west of the capital. During the day, the dust blanket moved north onto the Queensland capital of Brisbane. The bureau of meterology's senior forecaster Tony Auden told the Australian Broadcasting Corporation that the haze was likely to continue moving north. "It should make its way up into the Sunshine Coast and into those Capricornia and central coast areas soon," he said. "For the south-east expect it to probably linger for the rest of today and hopefully settle out of the air overnight."